Video games are an integral part of twentieth- and twenty-first-century cultural history. Although their reception has changed a lot in the last decade, they often are still perceived as non-historical and non-political media. Museums and cultural institutions are slowly beginning to approach video games both as a cultural phenomenon and an art form, but their socio-political importance—such as their interactions with identity, sexuality, and gender—remains largely unexplored. Rainbow Arcade at Berlin’s Schwules Museum is the first exhibition to explore the intersection of video games and queerness, drawing from the pioneering work of the LGBTQ Game Archive and Adrienne Shaw from Temple University. This exhibition catalog includes over 100 games, including the potentially first queer video game and love-letter to San Francisco’s queer community, Caper in the Castro (1989). The exhibition explores how social discourses and developments have been reflected in video games as well as progress in terms of queer representation in entertainment media. In addition, the catalog explores digital memory, the unique challenges posed by digital culture to archives and institutions, and the relative archival absence of contemporary (queer) media history. Thanks to 764 supporters on Kickstarter, the extensive research behind Rainbow Arcade was able be compiled in this exhibition catalog, including a detailed exhibition directory and supplementary texts by the curators, designers, and artists. 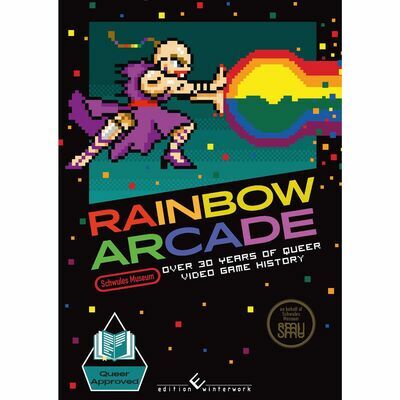 Rainbow Arcade demonstrates how queerness has always been part of video game culture and is curated by Sarah Rudolph (herzteile.org), Jan Schnorrenberg (Schwules Museum), and Dr. Adrienne Shaw (Temple University, LGBTQ Game Archive).